Chez Beeper Bebe: Curse You, Tiny Foods! Beeper made this drawing the other day at school. 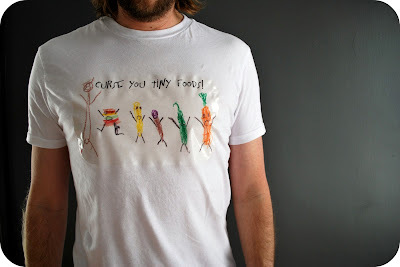 Let me explain the finer points of drawing to you: the brown man running on the left is yelling, "Curse you, tiny foods! "(except spelled like only a 6-year old would spell it: crs you tine food)--while the a gang of food items flee with their arms in the air (from the left they are: a burger, a banana, a grape ice cream cone, a green bean and a carrot). Of course, why wouldn't a series of little foods run away in what appears to be terror? I guess that would be my instinct if someone was about to eat me. Well, Mr Beeper thought this drawing was hilarious and could not stop walking around shaking his fist in the air all week and saying, "Curse you, tiny foods!" So, naturally, Beeper and I had to make him a t-shirt with the drawing on it for his birthday--it was a collaborative effort--see above. Yes, I photo-shopped the words in so they were actually legible. Yes, the transfer we used turned out sort of rubbery and puckery around the edges. But still, Mr Beeper loved it. Loads. And it does suit him. This post made me laugh out loud!! Your boy must be so proud to see his artwork worn by his daddy. Love it! I think I might start shouting 'curse you tiny foods too' especially to all the bits of food found under my sons chair! Jojoebi--that is brilliant! I cannot imagine a better way to apply this statement. That is hilarious. I love the shirt. Love the tee shirt! Your son might enjoy the books by Scott Morse called "The Magic Pickle." 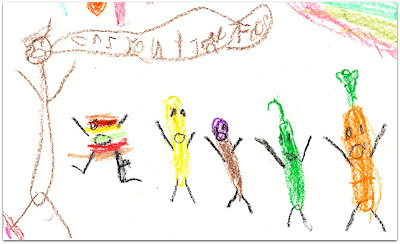 It's all about the evil foods and the Magic Pickle hero. This is only somewhat self-promotional, but I paint children's drawings (www.finedoodles.com, if you care to see what I mean), and thus I see a lot of kid's artwork. This one is a real gem. Love it. Summer-your work is amazing. I love it. It is inspiring. Thank you for sharing. That is so hillarious! What a lucky family to have such an awesome Mom & Dad. Those memories will for sure be cherished for years to come. That is so awesome Holly! I love it! "Curse you tiny foods!!" LOVE it!! Love the shirt. I really need to start saving some of my little ones drawings. Love your blog!